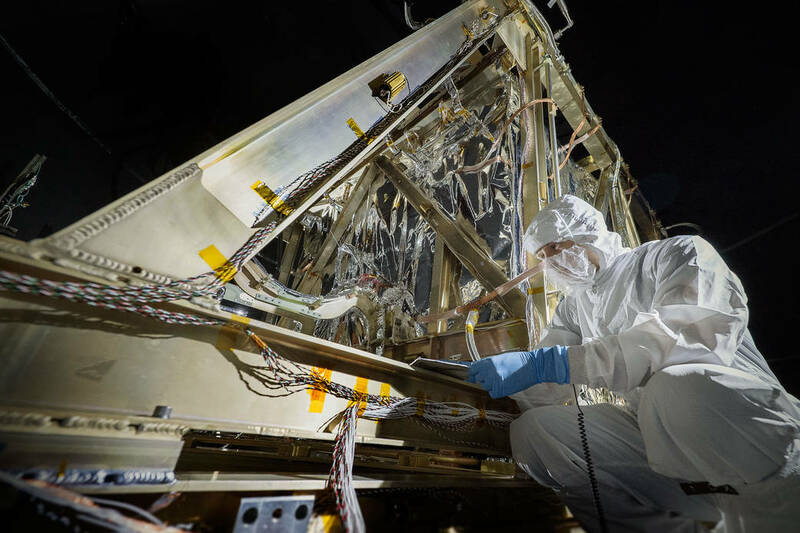 November 3, 2015 – At NASA’s Goddard Space Flight Center, the Integrated Science Instrument Module (ISIM), or the “heart” of the James Webb Space Telescope, is undergoing a third and final round of cryogenic tests in Goddard’s massive thermal vacuum chamber to prepare for the vacuum and extreme temperatures of space. In this October 27, 2015 photograph, Contamination Control Engineer Alan Abeel conducts final inspections and places contamination foils before the start of the test. This super cold test is vitally important for this large space telescope. Unlike a telescope you’d use in your backyard, scientists rely on remotely controlled mirrors and complex science measuring tools (instruments) to take in light from the distant universe. To do this, they must be rigorously tested on the ground to ensure they will work in space. The Webb telescope’s images will reveal the first galaxies forming approximately 13.5 billion years ago. The telescope will also see through interstellar dust clouds to capture stars and planets forming in our own galaxy. At the telescope’s final destination in space, one million miles away from Earth, it will operate at incredibly cold temperatures of -387 degrees Fahrenheit, or 40 degrees Kelvin. This is 260 degrees Fahrenheit colder than any place on the Earth’s surface has ever been.